The National Commission on Fiscal Responsibility and Reform proposed Wednesday perhaps the most sweeping spending cuts in U.S. history to prevent the federal budget from careening off a fiscal cliff into never-ending debt. 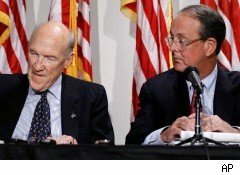 The commission co-chairs Republican Alan Simpson and Democrat Erskine Bowles (pictured left to right) have called their proposal the "Moment of Truth." Members of President Obama's 18-strong bipartisan commission agree -- as does practically everyone -- that the U.S. debt crisis must be addressed, although they disagree vehemently over how. A majority of the commission needs to approve the recommendations for them to be presented to Congress. Whether that's going to happen remains unclear. The commission is due to vote on the report on Friday. Commission members walked a tightrope in trying to restore America's finances without snuffing out the nascent economic recovery. The 59-pages of recommendations will likely please very few people. They include across-the-board spending cuts that would leave little of the American economy untouched. Tax revenues would be increased by $80 billion in 2015 by broadening the tax base, although rates would be lowered. The report argues that the U.S. has few choices but to go down the same path of austerity that has lead to civil unrest throughout Europe. "Economic activity will improve the deficit situation in the short-run because revenues will rise as people go back to work. . . . But even after the economy recovers, federal spending is expected to increase faster than revenues, so the government will have to continue borrowing money to spend," the report says. "We need a comprehensive plan now to reduce debt over the long term. We must end redundant, wasteful and ineffective federal spending, wherever we find it." As the commission notes, federal spending was 24% of gross domestic product in 2010 -- the highest rate since World War II. Tax revenue was 15% of GDP, the lowest since 1950. Interest on the debt could reach $1 trillion by 2020, as increasing numbers of baby boomers begin tapping Social Security. Public debt will equal as much as 135% of GDP by 2035. The committee co-chairs, as the The Wall Street Journal pointed out, "have taken particular aim at the country's tax code, especially the $1.1 trillion in tax breaks that many use to lower their taxable income, such as deductions for interest on mortgages." These ideas have all been discussed before and rejected for one reason or another. Whether they'll see the light of day this time around remains a huge question.